Members of the Dawn of War 2 community, including Co-Optimus, have received a mysterious package from THQ. 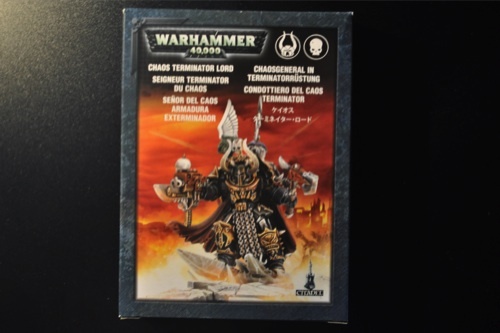 In it is a Chaos Terminator Lord figure from the Warhammer 40k universe, the exact same one seen here from Games Workshop. RelicNews think this points to an imminent announcement of an expansion. Having seen the new Last Stand mode demo'd at PAX there was a point in the presentation when something interesting happened. Instead of Tryanaids coming through the gates during a wave, we were greeted with Imperial Guard, all dressed in black. An audience member asked - "Does this mean we'll see Chaos Marines as a playable race in an expansion pack?" Relic didn't confirm it, but they more or less slyly stated that if it made sense we'd see it. Later on someone asked if we could see more than two player in co-op in the game. "That's definitely something we're looking at for the expansion." I guess we'll find out soon enough. The Last Stand launches on October 14th, I expect we'll hear about any other add-ons right around that time. Page created in 0.2834 seconds.